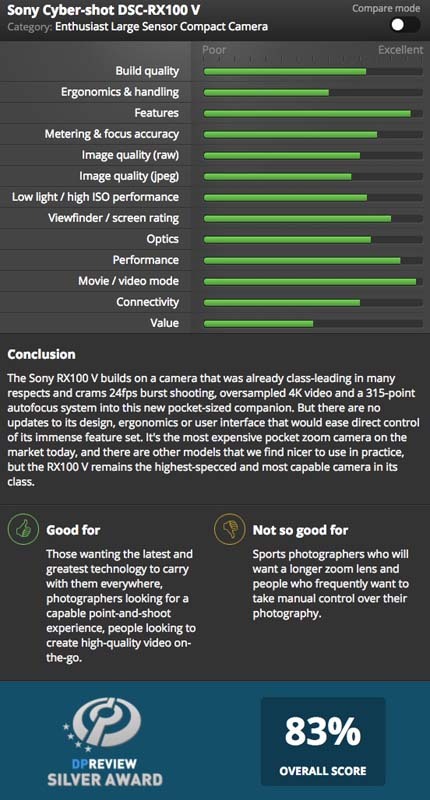 DPReview finished their review of the Sony RX100 V and I’m a bit surprised it only received a Silver Award. The Sony RX100 series has always been amazing for it’s size. I’m of the opinion that they were a bit unfair about it’s short comings e.g. “Not so good for Sports photographers who will want a longer zoom lens…” who is shooting sports with a pocket camera? Lack of external charger makes it harder to charge spare batteries. This entry was posted in Sony RX100 and tagged Sony RX100 V. Bookmark the permalink. Trackbacks are closed, but you can post a comment.